Tunicates (subphylum Urochordata or subphylum Tunicata) are marine, barrel-shaped invertebrates of the phylum Chordata. They are commonly called tunicates because they are covered by a tough covering, or tunic, and also are called sea squirts, because they squirt out water when touched (Towle 1989). As with all chordates—a group that includes lancets (subphylum Cephalochordata), hagfish (class Agnatha), and all vertebrates (subphylum Vertebrata)—tunicates have a notochord, a hollow dorsal nerve cord, and pharyngeal slits (or pharyngeal pouches). Tunicates have a notochord and dorsal nerve cord as larvae and retain gill slits in both the larval and adult stages (Towle 1989). Unlike vertebrates, tunicates lack a backbone or vertebral column. There are about two thousand species of urochordates (Towle 1989). While some tunicates spread by anthropogenic means in the ballast of ships are causing problems as invasive species, they also are integral to many food chains, are potential sources of immunosuppressant, antiviral and anticancer agents, and their diversity of form and color adds to human experience of nature. Tunicates may be solitary or colonial, and while larvae and some adults are pelagic (swimming or drifting in the open ocean), most adults attach to the sea bottom (Towle 1989). The motile larval stages may have the appearance of a tadpole, whereas the adult stage has a barrel-like, sedentary form. Tunicates are generally saclike filter feeders with two openings in their body cavity: an incurrent and an excurrent siphon. (There are also a few exceptions to this plan, like the predatory Megalodicopia hians, which looks something like a cross between a jellyfish and a Venus Flytrap.) The incurrent siphon is used to intake food and water and the excurrent siphon expels waste and water. The tunicate's primary food source is plankton. Plankton gets entangled in the mucus secreted from the endostyle. The tunicate's pharynx is covered by miniature hairs called ciliated cells that allow the consumed plankton to pass down through to the esophagus. Tunicates are also the only animals able to create cellulose. Tunicates lack segmentation, even in the tail. Metanephridia are absent. The original coelom (body cavity) is degenerated to a pericardial cavity and gonads. Except for the pharynx, heart, and gonads, the organs are enclosed in a membrane called an epicardium, which is surrounded by a jelly like matrix known as mesenchyme. Most tunicates are hermaphroditic. The eggs are kept inside their body until they hatch, while sperm is released into the water where it fertilizes other individuals when brought in with incoming water. Some larval forms appear very much like primitive chordates or hemichordates with a notochord (primitive spinal cord). The larval stage ends when the tunicate finds a suitable rock to affix to and cements itself in place. Many physical changes occur to the tunicate's body, one of the most interesting being the digestion of the cerebral ganglion previously used to control movement. From this comes the common saying that the sea squirt "eats its own brain." Once grown, adults can develop a covering, called a tunic, to protect themselves from enemies. In those adults that remain free swimming, the larvae undergo similar metamorphoses to a higher or lower degree. Tunicate blood is particularly interesting. It contains high concentrations of the rare metal vanadium and vanadium-associated proteins. Some Tunicates can concentrate vanadium up to a level one million times that of the surrounding seawater. It is still unknown how they do this or why. Sorberacea would belong somewhere in Ascidiacea, or be in a taxon on its own. For the moment, the traditional classification is followed. Some tunicates have a calcereous spicule that may be preserved as a fossil. These have been found from the Jurassic, as well as one proposed Neoproterozoic form, Yarnemia. Over the past few years, urochordates (notably of the genus Didemnum) have been invading coastal waters in many countries, and are spreading quickly. These mat-like organisms can smother other sea life, have very few natural predators, and are causing much concern. 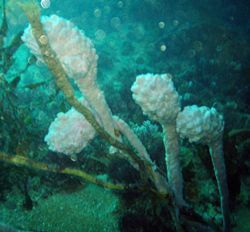 Transportation of invasive tunicates is usually in the ballast water or on the hulls of ships. Current research indicates that many tunicates previously thought to be indigenous to Europe and the Americas are, in fact, invaders. Some of these invasions may have occurred centuries or even millennia ago. In some areas, tunicates are proving to be a major nuisance in aquaculture operations. Didemnins – isolated from a tunicate of genus Trididemnum (family of Didemnidae), these exhibit indications of being strong antiviral agents against both DNA and RNA viruses, strong immunosuppressant, and activity against murine leukemina cells. Esteinascidin 743 – derivative of tunicates which “has been found to be useful in the treatment of skin, breast, and lung cancers” (Garrison 2005). ↑ Raloff, Janet. “Squid Alert.” Science News Online (Dec. 24, 2005). Retrieved June 13, 2007. USGS Wood Hole Science Center. 2006. Marine Nuisance Species: Genus Didemnum. Retrieved June 13, 2007. This page was last modified on 2 November 2008, at 23:26.